You've run the rest, now run the best. Winner of the UK's Best Half Marathon 3 years n a row. Like yours road closed? Then the Ealing Half Marathon is for you.! Now in its 8th year with closed roads and a 7,000 capacity race, our UKA measured course weaves its way through the surrounds and occasional undulations of Ealing, West London. Youll get the #EalingFeeling with over 30,000 spectators out lining the route and cheering you on, feel like a superstar with everyone calling your name as you chase down the miles. This race has a special feeling to it, look out for the signs welcoming runners from across the world. Is it your birthday on race day? Then you might spot a special sign just for you. Our large scale race has a welcoming feel with all the security and professionalism you expect from a road closed London event. Runners come back to Lammas Park to power through the final kilometer with supporters cheering on either side of the pathways making for a spectacular finish where you can claim your exclusive medal. The sooner you enter the more you save. Don't delay, book your place today. 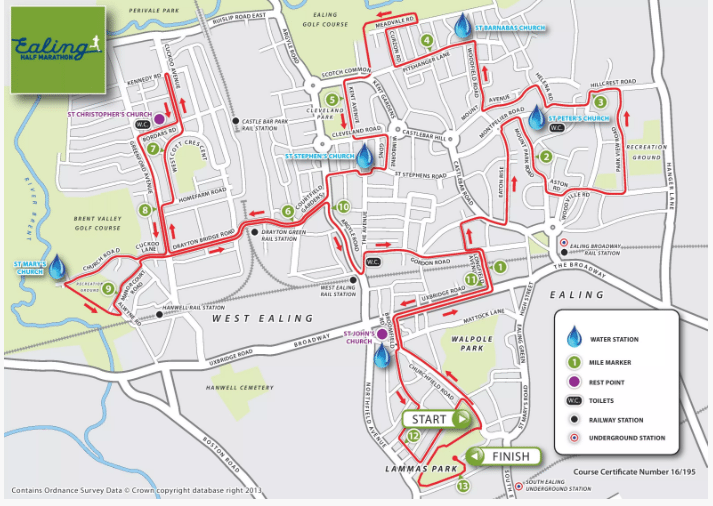 The 2019 race will again be starting and finishing in Lammas Park (Ealing W5 5JH) where the race and retail village will also be located. The Ealing Half Marathon is West London’s only fully road closed half marathon and multi award winning, making it a must-do in the running calendar. Your race number is included in your race pack and should be affixed to the front of your race kit with the number clearly visible. Your personal and emergency details must be written on the reverse of the race number. the function of the chip. Xempo are providing pace makers who will be clearly identifiable and located adjacent to the relevant start zone area. Xempo pace makers will be guiding runners aiming for times of: 1h30, 1h40, 1h50, 2h00, 2h10, 2h20 and 2h30. A pre-race warm up will take place in the South section of Lammas Park from 08:30. This session will loosen up the muscles and joints and relax the whole body in preparation for the 13.1 miles that lie ahead. The race will start promptly at 09:00 and runners should start to assemble in the start zone from 08:45. Signs will be placed throughout the start zone according to estimated finish time and we ask that you assemble in the most appropriate zone for the enjoyment and safety of all runners. Elan natural mineral water will be available to runners in 200ml bottles at our 5 official water stations which are at 2, 4, 6, 9 and 12 miles, as well as after the finish line. Please try to dispose of your bottle safely in or close to the bins provided on the course. A recycling service for the 40,000+ plastic bottles will be in place. Northfields Station on the Piccadilly Line (Heathrow Branch) is within a 10 minute walk of the Start/Finish area. Ealing Broadway Station on the Central and District Lines, is a 15 minute walk from the Start/Finish area. Please go to the TfL Journey Planner www.journeyplanner.tfl.gov.uk for more details. Mainline from London Paddington to Ealing Broadway Station (just one stop, 10 minutes) which is a 15 minute walk from the Start/Finish area. From the West, Ealing Broadway is served by trains from Slough, Maidenhead, Reading and beyond. Please note that West Ealing & Hanwell stations are not operational on Sundays. Avenue which is adjacent to the Start/Finish area. Please note that diversions are in operation on the 207/427 and 83 routes on the morning of the race. If you are driving to the event, please try to car-share with other participants to minimize the environmental impact and disruption to local residents. Please leave enough time to park and walk to the Race HQ. Road closures will come into effect before the start of the event and there will be no parking on the roads surrounding the Race HQ. And great local support & 700 volunteers to get you round on the day. Medical and safety matters are of utmost importance to all at the Ealing Half Marathon. We want you to enjoy your race but if you do suffer illness or injury on the day, our specialist medical team will endeavor to provide the best possible response. Watch out for the speed bumps!